I’m really close to finishing my first book! I have run into a bout of writer’s block and I finally realized what the problem is. I don’t want to make my bad guy bad. I’ve been reading all sorts of blogs and books and I know this is a common rookie mistake. My first pass at this book had the antagonist simply being another good guy who had conflicting interests with my hero. Specifically, he wanted my heroin too. Oh, and his mission was to destroy my hero’s trade. But still, my Mr. Bad was actually another Mister Good. He decided he had to wed the heroine, against her will, to protect her reputation, even though he didn’t actually love her. He was a stuck up, stiff character akin to Daniel Day Lewis’ role as the fiance of Helena Bonham Carter in A Room With A View. He was honorable and a decorated naval officer. He was the farthest thing from bad that an antagonist could get. But I know how to learn from other people’s mistakes and I’ve read the warning enough times to know my Mr. Not So Right will not do. So I had to go back and re-work the entire book to create a proper bad guy. A bad guy who we will all want to hate. Oh sure, he’ll have some redeeming qualities, but I now know I can’t make him so good that it becomes confusing who the hero of the story actually is. And so, I’ve set the tone. I’ve modified the plot to prepare for his incorporation. I know what he’s going to do and how he’ll do it. I’m ready to write the chapter where he meets the heroine. She was supposed to meet him in the previous chapter, but I chickened out and ended the sequence with her on her way to meet him. Why won’t it come? Why can’t I simply type out on the computer this man who will attempt to destroy the livelihood and happiness of my beloved heroes? Last night lying in bed it, hit me. I can’t create unlovable characters. No, I suppose I can. 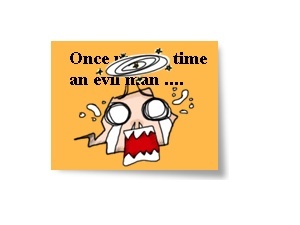 I am just loathe to release villainy into the atmosphere. I want to adore anything I make. I need fairy tale happy endings and I hate conflict. So the bad guys just won’t come. Anyone got any ideas on how to get inspired to create the blackness of evil? Everyone talks about the need to be prepared for eventual success as an author. In this scenario, success simply means getting your book published. When that coveted moment happens, we are told we should already have an established blog, a web site and established social media platforms such as a twitter account and a Facebook page. I totally get why it would be a good idea to have these set up early. Once the ball starts rolling on promoting your little miracle (a burden that largely falls on the shoulders of authors now-a-days) you will have little time to build a web site. 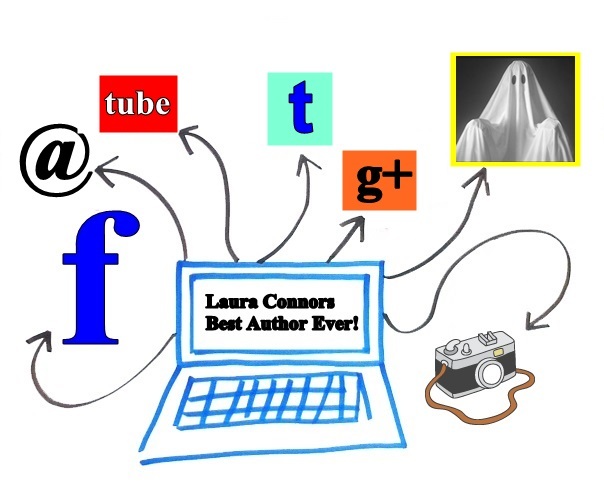 But honestly, as I make my “Laura Connors Author” website, I can’t help but wonder who in the heck will bother to read it. I’m not a published author, ergo the general consensus would be I am not an author at all. Just a wannabe writer. And there are days when I think that myself. But I will follow this advice, offered by so many multi-published authors, because I know they are right. Besides, acting as if I am a published author will make it all the more likely to happen, right? So let’s assume the twitter account and my author page will be filled with cat pictures until I have something substantial to tout, like my debut novel. I am okay with that. And I’m okay with a website that leaves little blank boxes for me to fill in with my books as they are published. There are other things I want to be ready for when the big dream finally gets realized. Last month, I attended a book signing that included a current NYT best selling author and several of my published chapter-mates of RWA (Romance Writers of America). While I stood in line, waiting to get a paperback signed by one of my RWA friends, I marveled at the person in line in front of me. It was a middle-aged man. I had first noticed him earlier, hanging around while we waited for the book signing to get started. I was impressed that a man was willing to admit he read romance novels and would even wait in public to get one signed by the author. I considered the possibility that he was there for his wife, who maybe just happened to love one of the great authors waiting to sign books. Or maybe he was getting his daughter an autographed book for Christmas, that would certainly make a nice gift. But then I found myself in line behind him as we waited for my friend’s signature on her popular new paranormal release. I decided to make small talk, since I was so fascinated by the presence of this lone man. To be fair, there were other men present, obviously dragged there by their wives, and making it clear they were not in line. But this man was obviously in line, patiently awaiting his turn. “Excuse me?” I asked, wondering if perhaps he had been waiting an insanely long time. “Uh, I guess.” Where he was going with this? Where he was going was into a long diatribe about how he and his abused brothers had been in the foster system and in the last twenty years they had seen each other for a total of forty two hours. He told me he intended to inform my friend, who was innocently sitting there signing the novels she had worked so hard to write, that he would provide the title and the story and all she had to do was write it. All she had to do. So seemingly simple. After all, the title was already figured out. What else did you need? He was so convinced of the strength of this title that he suggested the book would sell on that alone. Realizing I was now standing in line behind a slightly crazy person, I tried to think of something to say that would prevent me from having to engage him any longer, but would also dissuade him from putting my friend in a very uncomfortable situation. I finally proposed that his story would best be written by someone who wrote non-fiction. Since my friend was signing her paranormal romance, she was perhaps not the best person to write his book. Thankfully, he gave it some thought and ducked out of the line before we reached her table. But what if this happened to me and there was no friend in line to deflect the “Why don’t you write my story” types? How would I deal with that while trying to promote my own book? I was offended that he believed writing a book is so simple all you need is a title. 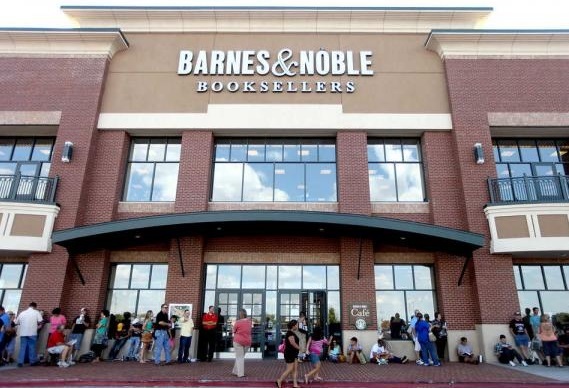 How could I gracefully get him to go away without causing a scene or scaring the real readers in line for an autograph? There’s more than social media and promotion that we need to have started by the time our first book comes out. We need lessons on how to conduct ourselves in awkward social situations. We need practice autograph signings or something. Dream big, Laura, but be ready. Already we are in a little 1,000 ft. cement square box on a month to month lease while we search for a house. We’ve been hunting for a house for so long that our MLS listing expired with our realtors. It’s been more than a year that we have been looking. We’ve seen almost 200 houses. We’re pretty sure our inability to find a house has caused marital strife between our realtors. Hopefully they will stick with us while we try to find the perfect house for us. This decision to take advantage of the amazing interest rates currently going on occurred after we returned from our around the world honeymoon. Hello, almost one year later. I’m terrible at keeping up with a blog. In the time that I failed to blog, I finished my first book! It isn’t great, although it has some wonderful moments. I’m disappointed in the ultimate final conflict – it’s need to me more… conflicty. The good news is I have received encouragement in the form of placing in the finals of three different writing contests last fall. So yay for that. We also bought a house. I actually went to Hungary for six months to work on a television show because I still have to contribute to the household expense. The amazing thing is that when I returned from that awful gig, we found the house we’ve been searching for the next day! So now we’re homeowners. It’s taken two months and finally, I have an office that is somewhat ready for me to write in. There is a desk at least. And I do sit down and try to write. But I get distracted. Food, facebook, questions of if I’m depressed, do I have ADD, am I just a sucky writer living a fools dream. So I procrastinated, I stalled, I invented reasons, I read. But I never really got back to writing. Then So You Think You Can Write came up. It reinvigorated me to get back to my finished manuscript and try to get it out. SO I tweaked and tweaked and tweaked. The thing is, this story (which did not final in the contest), has a great voice and fabulous setting. There are wonderful scenes between the protagonists. But for a romance novel, it is fundamentally flawed. The characters don’t meet right away. It is a love story, but the arc only happens in the last half of the book and very quickly. So, does one abandon their first baby and move on or keep trying to resuscitate it when you already know what the editors will say? I think I’ll try to move on… Just as soon as I look up the symptoms of ADD. Before this moment, my life was full of unique adventures. I traveled the world on a thirteen month honeymoon and lived abroad for two years. I’ve rubbed elbows with movie stars and been places that only an all-access ticket from Hollywood could create. Maybe some day I’ll talk about those experiences. They probably sound very romantic. But it is now, in my 41st year that I am trying to claim the romance of my life. Perhaps I should explain what I mean by this. While the previous years involved some amazing encounters, with the exception of my honeymoon, my heart wasn’t in them. I wasn’t living the life I wanted to lead and I didn’t have to courage to admit what it was I really wanted. Ever since the fourth grade and Mrs. Lundgren suggested my parents get me a thesaurus for Christmas (the best prezzie ever), I have wanted to be a writer. Occasionally I would mention this fact to my mother or sister, but for the most part I suppressed this seemingly insurmountable dream. Instead I accepted that I would need to choose a real-world job. Never mind that I studied theater in college and accidentally became an accountant in Hollywood. My common sense only goes so far. But I am finally ready to admit that I want to write books for a living. More specifically romance novels. I love them. I consume them voraciously, provided they are written well. There is a misconception that romance novels are for the weak of mind and that they are not necessarily the highest quality of composition. To those possessing this assumption, I suggest a quick delve into a Susan Elizabeth Phillips book. Try to put down Natural Born Charmer after the first ten pages – my guess is you won’t be able to. And you’ll laugh out loud. I have joined the Romance Writers of America and specifically the San Diego chapter to help me pursue my new dream. I am learning so much about my genre that I never knew before. The amount of time we spend debating character, plot, and story arc is overwhelming. My new associates blog frequently about the importance of a good antagonist, the needs of the hero and the infamous GMC (goal, motivation and conflict). My mentors spend a great deal of time on their craft. We are all trying not to just write a book that has a happy ending and a little heat, but a book that is written well. Books we are proud to put our name on. Where did my love for this genre come from? This is the first memory I have of a heart-breaking moment that I wished with all my heart I could change. 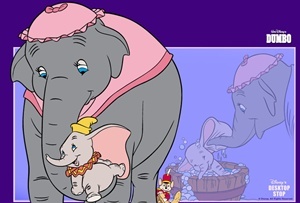 Why couldn’t we prevent Dumbo’s mother from being jailed and deprived of caring for her son, the greatest joy of her life? For that matter, why couldn’t we keep Bambi’s mother safe or somehow stomp out the great forest fire. Why did Sophie have to make such an awful choice? Why couldn’t Romeo wait just one more minute for Juliette to wake up. The world is full of painful events that could have been prevented. Tragedies are nearly unbearable for me. So I turned to romance novels – a world where love conquers all and the ending is always happy. Who doesn’t want that kind of escape from the real world from time to time? I want to create those stories and help people get that moment of reprieve from the harsh reality of life. So wish me luck in my quest to create a new life filled with romance and possibilities. I’ll be blogging from time to time on anything and everything. Also, feel free to check out my alterego, Luscious, a snarky commentator of hit tv shows on the famous recap site TVgasm.com. Here’s a link to some of my reviews. Follow me on twitter at LusciousLLLL.